Legend tells us that the Rosary as a form of prayer was given to St. Dominic (1170- 1221) by Mary, the Mother of Our Lord, who entrusted it to him as an aid in the conflicts with the Albigensians. The Dominican pope, St. Pius V, did much to further the spread of the Rosary and it thereafter became one of the most popular devotions in Christendom. It was the same Pope St. Pius V, who in 1569 officially approved the Rosary in its present form with the Papal Bull, CONSUEVERUNT ROMANI PONTIFECES. It had been completed by the addition of the second half of the "Hail Mary" and the "Glory be to the Father" at the conclusion of each mystery. Current scholarship traces the development of the Rosary to the High Middle Ages where it came into being in various medieval monasteries as a substitute for the Divine Office for the lay monks and devout lay persons who did not know how to read. Instead of the 150 psalms, they would pray 150 "Our Fathers" counting them on a ring of beads known as the crown or "corona". With the growth of popularity of Marian devotion in the twelfth century, the "Psalter of the Blessed Virgin Mary" developed now substituting 150 "Hail Marys" in place of the "Our Fathers." The 150 "Hail Marys" were subsequently subdivided into 15 decades by the young Dominican friar, Henry Kalkar (1328-1408), with each decade referring to an event in the life of Jesus and Mary. The Dominican, Ananus de Rupe (1428-1478) further divided the episodes in the history of salvation into the joyful, sorrowful and glorious mysteries. He also attributed the origin of the Rosary , then known as the "Psalter of the Blessed Virgin" to St. Dominic and thus spurred the Dominican Order to make the Apostolate of the Rosary their special concern. The Dominicans have, since then, promulgated the Rosary with notable results. 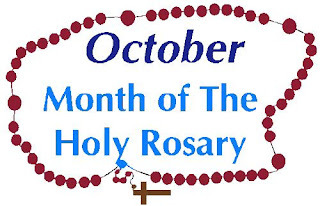 The practice of dedicating the entire month of October to the Holy Rosary developed toward the end of the last century. Pope Leo XIII ( papacy: 1878-1903 ) strongly promoted the increase of devotion to the Blessed Mother by encouraging the constant use of the Rosary. Beginning on September 1, 1883, with SUPREMO APOSTOLATUS OFFICIO, he wrote a total of eleven encyclicals on the Rosary , ending with DIUTURNI TEMPORIS in 1898. We are currently celebrating the centennial of these papal encyclicals. 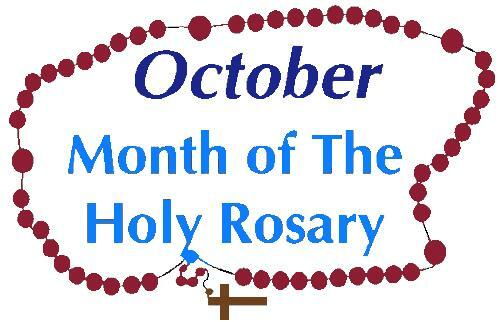 The Rosary is primarily a scriptural prayer. This can be summarized by the traditional phrase used by Pope Pius XII (papacy: 1939-1958) that the Rosary is " a compendium of the entire Gospel" (AAS 38  p.419) . The Rosary draws its mysteries from the New Testament and is centered on the great events of the Incarnation and Redemption.